This article is about the sports car race. For the motorcycle race, see 24 Hours of Le Mans (motorcycle race). For other uses, see 24 Hours of Le Mans (disambiguation). For the 2019 race, see 2019 24 Hours of Le Mans. The 24 Hours of Le Mans (French: 24 Heures du Mans) is the world's oldest active sports car race in endurance racing, held annually since 1923 near the town of Le Mans, France. It is considered one of the most prestigious automobile races in the world and has been called the "Grand Prix of Endurance and Efficiency". The event represents one leg of the Triple Crown of Motorsport; other events being the Indianapolis 500 and the Monaco Grand Prix. The race is organized by the Automobile Club de l'Ouest (ACO) and is held on the Circuit de la Sarthe, which contains a mix of closed public roads and dedicated sections of racing track, in which racing teams must balance the demands of speed with the cars' ability to run for 24 hours without mechanical failure. Of the 60 cars which qualified for the 2018 race, 41 cars ran the full duration. Since 2012, the 24 Hours of Le Mans has been a part of the FIA World Endurance Championship. Because of the decision to run a World Endurance Championship super-season in the period May 2018 to June 2019, the 24 Hours of Le Mans will be run twice in the same season: it will be both the second and the last round of the season. In 2011 it was a part of the Intercontinental Le Mans Cup, and it frequently formed a part of the World Sportscar Championship from 1953 until that series' final season in 1992. Over time, Le Mans has influenced events that have sprung up all around the globe, popularizing the 24-hour format at locations such as Daytona, Nürburgring, Spa-Francorchamps, and Bathurst. The American Le Mans Series and Europe's Le Mans Series of multi-event sports car championships were spun off from 24 Hours of Le Mans regulations. Other races include the Le Mans Classic, a race for historic Le Mans race cars from years' past held on the Circuit de la Sarthe, a motorcycle version of the race which is held on the shortened Bugatti version of the same circuit, a kart race (24 Heures Karting), a truck race (24 Heures Camions), and a parody race 24 Hours of LeMons. The 2019 24 Hours of Le Mans (French: 87e 24 Heures du Mans) will be held on June 15–16 at the Circuit de la Sarthe, Le Mans, France. At a time when Grand Prix motor racing was the dominant form of motorsport throughout Europe, Le Mans was designed to present a different test. Instead of focusing on the ability of a car company to build the fastest machines, the 24 Hours of Le Mans would instead concentrate on the ability of manufacturers to build sporty yet reliable cars. This encouraged innovation in producing reliable and fuel-efficient vehicles, because endurance racing requires cars that last and spend as little time in the pits as possible. At the same time, the layout of the track necessitated cars with better aerodynamics and stability at high speeds. While this was shared with Grand Prix racing, few tracks in Europe had straights of a length comparable to the Mulsanne. Additionally, because the road is public and thus not as meticulously maintained as permanent racing circuits, racing puts more strain on the parts, increasing the importance of reliability. The oil crisis in the early 1970s led organizers to adopt a fuel economy formula known as Group C that limited the amount of fuel each car was allowed. Although it was later abandoned, fuel economy remains important as new fuel sources reduce time spent during pit stops. Such technological innovations have had a trickle-down effect and can be incorporated into consumer cars. This has also led to faster and more exotic supercars as manufacturers seek to develop faster road cars in order to develop them into even faster GT cars. Additionally, in recent years hybrid systems (flywheel, super-capacitor, battery coupled with both gasoline and diesel) have been championed in the LMP category as rules have been changed to their benefit and to further push efficiency. The race is held in June, leading at times to very hot conditions for drivers, particularly in closed vehicles with poor ventilation; rain is commonly seen. The race begins in mid-afternoon and finishes the following day at the same hour the race started the previous day. Over the 24 hours, modern competitors often cover distances well over 5,000 km (3,110 mi). The record is 2010's 5,410 km (3,360 mi), six times the length of the Indianapolis 500, or approximately 18 times longer than a Formula One Grand Prix. Drivers and racing teams strive for speed and avoiding mechanical damage, as well as managing the cars' consumables, primarily fuel, tyres, and braking materials. It also tests endurance, with drivers frequently racing for over two hours before a relief driver can take over during a pit stop while they eat and rest. Current regulations mandate that three drivers share each competing vehicle. Competing teams race in groups called "classes", or cars of similar specification, while also competing simultaneously for outright placing amongst all classes. Originally, the race showcased cars as they were sold to the general public, then called "Sports Cars", in contrast with the specialised racing cars used in Grand Prix motor racing. Over time, the competing vehicles evolved away from their publicly available road car roots, and today the race is made of two overall classes: prototypes, and Grand Touring cars (similar to sports cars sold to the public). These are further broken down into 2 sub-classes each, constructors' prototypes, privateer prototypes and 2 subclasses of GT cars. Competing teams have had a wide variety of organization, ranging from competition departments of road car manufacturers (eager to prove the supremacy of their products) to professional motor racing teams (representing their commercial backers, some of which are also car manufacturers who want to win without paying for their own teams) to amateur teams (racing as much to compete in the famous race as to claim victory for their commercial partners). The race has also spent long periods as a round of the World Sportscar Championship, although Le Mans has always had a stronger reputation than the World Championship, and is a round of the FIA World Endurance Championship. The race is also known as a leg of the informal Triple Crown of Motorsport which links Formula One, IndyCar, and sports car racing to represent a career achievement for drivers. Additionally, it is seen as a leg of the Triple Crown of endurance racing, which links the three largest sports car races together, with 12 Hours of Sebring and 24 Hours of Daytona forming the other legs. Since 1998, the American Le Mans Series (Now the IMSA Weathertech Sports Car Championship) holds an endurance race, along with the 12 hours of Sebring, every year called "Petit Le Mans", as a 10-hour American version. In 2014, the Weathertech Sports Car Championship (a merger of the races at Sebring; Petit Le Mans in Braselton, Georgia; the 6 Hours of Watkins Glen in Watkins Glen, New York; and the Rolex Sports Car Series' 24 Hours of Daytona) held all four major American endurance classics in preparation for teams to race at Le Mans. The race has approximately 60 competitors. Each car was required to have at least two seats, but recently cars only need the ability to accommodate a second seat in the cockpit rather than the seat itself. No more than two doors are allowed; open cockpit cars do not require doors. Since 2014, all cars in the premier LMP1 category must have a roof due to safety concerns, with open-cockpit cars only permitted in the slightly slower LMP2 category. Since 2017, all prototype cars, LMP1 or LMP2, must have closed cockpits. Although all cars compete at the same time, there are separate classes. A prize is awarded to the winner of each class, and to the overall winner. The number of classes has varied over the years, but there are now four. Custom-built Le Mans Prototypes (LMP) are the top two classes, LMP1 and LMP2, divided by speed, weight, and power output. From 2011, the next two classes are production-based grand tourer (GT) classes, GT Endurance Pro and GT Endurance AM. Both of these classes use the LM GTE, or "Le Mans Grand Touring Endurance" regulations. Although the top class is the most likely to be the overall winner, lower classes have won on occasion due to better reliability. Originally, there were no rules on the number of drivers of a car, or how long they could drive. Although almost all teams used two drivers in the early decades, some Le Mans drivers such as Pierre Levegh and Eddie Hall attempted to run the race solo, hoping to save time by not having to change drivers. This practice was later banned. Until the 1980s, there were teams in which only two drivers competed, but by the end of the decade, the rules were changed to stipulate that at least three drivers must drive each car. By the 1990s, due to the speeds of the cars and the strain it puts on drivers, additional rules to reduce driver fatigue mandated that drivers could not drive for over 240 minutes over a 6-hour period, and that no one driver could run for over 14 hours total. With careful management of driver stints, this makes it possible to complete the race with only two drivers (as Jeroen Bleekemolen and Cooper MacNeil did in 2014), although the vast majority of teams still continue to use three drivers. Although it has been a part of the World Sportscar Championship for most of its existence, the race has had different regulations for safety and competition reasons partly due to its length. For many decades, cars were required to run at least an hour into the race before they were allowed to refill fluids for the car, such as oil or coolant, with the exception of fuel. This was an attempt by the ACO to help increase efficiency and reliability. Cars which could not last the first hour without having to replace lost fluids were disqualified. Another rule unique to Le Mans is that cars must be switched off while they are refuelled in the pits. Not only is this safer and less of a fire hazard, but it is also another test of reliability, as cars with the guaranteed ability to restart many times under race conditions are harder to make. Another element of this rule is that mechanics are not allowed to work on the car while it is being refuelled (other than helping a driver in or out of the car), which has led teams to adapt innovative ways in which to decrease the time of these lengthy pit stops. Drivers are allowed to get out of the car and be replaced by another driver during refuelling. Those rules are also in application in the FIA World Endurance Championship. There are various long-standing traditions at Le Mans, including the waving of the French tricolor to start the race. This is usually followed by a fly-over featuring jets trailing blue, white and red smoke. A similar flag tradition is the waving of safety flags during the final lap of the race by track marshals, congratulating the winners and other finishers. Le Mans was the venue for the first televised instance of a winning driver celebrating by spraying champagne instead of drinking it. When Dan Gurney won the 1967 race with co-driver A. J. Foyt, the two drivers mounted the victory podium and Gurney was handed a magnum of champagne. Looking down, he saw Ford CEO Henry Ford II, team owner Carroll Shelby and their wives, as well as several journalists who had predicted disaster for the high-profile duo. Gurney shook the bottle and sprayed everyone nearby. Gurney autographed and gave the bottle of champagne to Life photographer Flip Schulke, who used it as a lamp for years before returning it to Gurney. The first race was held on 26 and 27 May 1923 and has since been run annually in June with exceptions in 1956, when the race was held in July, and 1968, when it was held in September due to nationwide political turmoil in May. The race has been cancelled ten times—in 1936 (a labour strike during the Great Depression) and between 1940 and 1948 (World War II). The race usually takes place on the second weekend of June, with qualifying and practice taking place on the Wednesday and Thursday before the race, following a car inspection on Monday and Tuesday. Currently, these sessions are held in the evening, with two separate two-hour sessions held each night. Friday serves as a day of rest and a parade of all the drivers through Le Mans is held. Test days held at the end of April or beginning of May served as a pre-qualification weeding out the slowest cars. However, in 2005 the exorbitant cost of transporting cars to and from Le Mans led organizers to move the test day to the first weekend of June. In fact pre-qualification was eliminated in 2000, meaning that all competitors invited to the test would be allowed into the race. Since 2001 the Le Mans Legend races have also been part of the schedule, usually running exhibition races during qualifying days, a few hours prior to the sessions for the Le Mans entrants. Until 2008, the race started at 16:00 on Saturday (though in 1968, the race started at 14:00 due to the lateness of the race on the calendar. In 1984 and 2007, the start time was moved ahead to 15:00 due to the conflicting election). In 2006, the ACO scheduled a 17:00 start time on Saturday, 17 June in order to maximize television coverage in between the World Cup games. Since 2009, when the race took place from 13–14 June, it starts at 15:00 local time (CEST, 13:00 UT). Originally, the car that covered the greatest distance from its starting position was the winner. This is known to have caught out the Ford team in 1966. With a dominant 1–2 lead, the two cars slowed to allow for a photo opportunity at the finish line, with Ken Miles slightly ahead of Bruce McLaren. However, since McLaren's car had actually started much farther back on the grid than Miles's, McLaren's car had actually covered the greatest distance over the 24 hours. With the margin of victory determined to be eight metres, McLaren and his co-driver, Chris Amon, were declared the winners. The decision cost Miles and Denny Hulme a victory. Miles had already won the other two endurance races at Sebring and Daytona. With a win at Le Mans, he would have become not only the first man to win all three, but the first to win them all in the same year. The "greatest distance" rule was modified with the introduction of a rolling start in 1971, and now the car that completes the greatest distance as of the completion of the final lap – where "greatest distance" is measured by the start/finish line for all competitors – wins. When two cars finish the same number of laps, their finishing order is determined by the faster overall completion time. This rule was used in the 2011 24 Hours of Le Mans to determine the race winner, when the top two finishers both completed 355 laps, with only 13 seconds difference between them. Although "greatest distance run" determines the provisional order of finishers, additional requirements must be met for a car to be classified. A car must complete the last lap of the race, and must complete the entire circuit faster than a prescribed maximum lap time. Ambiguity in this classification requirement has led to dramatic scenes where damaged cars have waited in the pits or on the edge of the track close to the finish line, then restarted their engines and crawled across the line to be listed amongst classified finishers. The practice of intentionally "waiting for the final lap" in this manner has been prohibited by rule in recent years. Cars must complete 70 percent of the distance covered by the overall winner to be classified. A car failing to complete this number of laps, even if it finishes the last lap of the race, is not deemed worthy of classification because of poor reliability or speed. All classification requirements hold except in exceptional circumstances, as determined by the race stewards. The race traditionally began with what became known as the Le Mans start, in which cars were lined up along the length of the pits. Until 1962, cars were lined up in order of engine capacity, but beginning in 1963 qualifying times determined the lineup. The starting drivers stood on the opposite side of the front stretch. When the French flag dropped to signify the start, the drivers ran across the track, entered and started their cars without assistance, and drove away. This became a safety issue in the late 1960s when some drivers ignored their safety harnesses, then a recent invention. This led to drivers running the first few laps either improperly harnessed due to attempting to do it while driving or sometimes not even harnessed at all, leading to several deaths when cars were involved in accidents due to the bunched field at the start. This starting method inspired Porsche to locate the ignition key switch to the left of the steering wheel. In a left-hand drive car, this allowed the driver to use his left hand to start the engine, and his right hand to put the transmission into gear, which in turn shaves off a few tenths of a second. Another method for speeding up the start was developed by Stirling Moss. His car was waiting with first gear already engaged. When he jumped in, he switched the starter on without depressing the clutch. The car was immediately jerked forward by the starter motor, but the engine did not start due to low RPM. After a few seconds of motion, he then pushed the clutch down, allowing the engine to speed up and start while the car was moving. Feeling this type of start was unsafe, in the 1969 race, Jacky Ickx opposed it by walking across the track while his competitors ran. Although he was nearly hit by a faster competitor's car while walking, Ickx took the time to fasten his safety belts before pulling away. Privateer John Woolfe died in an accident on the first lap of that race; Ickx won. The traditional Le Mans start was changed for 1970. Cars were still lined up along the pit wall, but the drivers were already inside and strapped in. At the dropping of the French tricolor, the drivers started their engines and drove away. Since 1971, when that method was done away with, a rolling start (sometimes known as an Indianapolis start) begins the race. 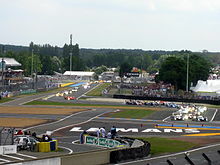 The circuit on which the 24 Hours of Le Mans is run is named the Circuit de la Sarthe, after the department that Le Mans is within. It consists of both permanent track and public roads that are temporarily closed for the race. Since 1923, the track has been extensively modified, mostly for safety reasons, and now is 13.626 km (8.467 mi) in length. Although it initially entered the town of Le Mans, the track was cut short in order to better protect spectators. This led to the creation of the Dunlop Curve and Tertre Rouge corners before rejoining the old circuit on the Mulsanne. Another major change was on the Mulsanne itself in 1990, when the FIA decreed that it would no longer sanction any circuit that had a straight longer than 2 km (1.2 mi). To comply with this, two chicanes were added to the 6 km long straight. The addition of the chicanes was further influenced by the fact that the speed of WM P88-Peugeot French driver Roger Dorchy had been timed at 405 km/h (252 mph) during the 1988 race. Due to the shorter length of the straights, top speeds at Le Mans are now generally around 205 mph (330 km/h). The public sections of the track differ from the permanent circuit, especially in comparison with the Bugatti Circuit which is inside the Circuit de la Sarthe. Due to heavy traffic in the area, the public roads are not as smooth or well kept. They also offer less grip because of the lack of soft-tyre rubber laid down from racing cars, though this only affects the first few laps of the race. The roads are closed only within a few hours of the practice sessions and the race, before being opened again almost as soon as the race is finished. Workers have to assemble and dismantle safety barriers every year for the public sections. For a list of individual race reports, see Category:24 Hours of Le Mans races. The 24 Hours of Le Mans was first run on 26 and 27 May 1923, through public roads around Le Mans. Originally planned to be a three-year event awarded the Rudge-Whitworth Triennial Cup, with a winner being declared by the car which could go the farthest distance over three consecutive 24-hour races, this idea was abandoned in 1928 and overall winners were declared for each single year depending on who covered the farthest distance by the time 24 hours were up. The early races were dominated by French, British, and Italian drivers, teams, and cars, with Bugatti, Bentley, and Alfa Romeo being the top brands. Innovations in car design began appearing at the track in the late 1930s, with Bugatti and Alfa Romeo running highly aerodynamic bodywork in order to run down the Mulsanne Straight at faster speeds. The race was cancelled in 1936 due to general strikes in France, and the outbreak of World War II in 1939 resulted in a ten-year hiatus. Following the reconstruction of circuit facilities, the race was resumed in 1949 with renewed interest from major automobile manufacturers. 1949 was also Ferrari's first victory, the 166MM of Luigi Chinetti and Peter Mitchell-Thomson. After the formation of the World Sportscar Championship in 1953, of which Le Mans was a part, Ferrari, Aston Martin, Mercedes-Benz, Jaguar and many others began sending multiple cars backed by their respective factories to compete for overall wins against their competitors. This competitiveness sometimes resulted in tragedy, as in the 1955 Le Mans disaster during the 1955 race in which Pierre Levegh's car crashed into a crowd of spectators, killing more than 80 people. The incident led to the widespread introduction of safety measures, not only at the circuit, but elsewhere in the motorsport world. Following the accident, the entire pit complex was razed and rebuilt further back allowing the pit straight to be widened, although there was still no barrier between the track and the pit lane. Safety standards improved but the cars got faster, and the move from open-cockpit roadsters to closed-cockpit coupés resulted in speeds of over 320 kilometres per hour (200 mph) on the Mulsanne. Ford entered the picture with the GT40, finally ending Ferrari's dominance with four straight wins (1966-1969) before the 1960s ended and the cars, and the race, changed substantially. For the new decade, the race took a turn towards more extreme speeds and automotive designs. These extreme speeds led to the replacement of the typical standing Le Mans start with a rolling Indianapolis start. Although production-based cars still raced, they were now in the lower classes while purpose-built sportscars became the norm. The Porsche 917, 935, and 936 were dominant throughout the decade, but a resurgence by French manufacturers Matra-Simca and Renault saw the first victories for the nation since the 1950 race. This decade is also remembered for strong performances from many privateer constructors, with two scoring the only victories for a privateer, in the decade. John Wyer's Mirage won in 1975, while Jean Rondeau's self-titled chassis took 1980. The rest of the 1980s was known for the dominance by Porsche under the new Group C race car formula that encouraged fuel efficiency. Originally running the effective 956, it was later replaced by the 962. Both chassis were affordable enough for privateers to purchase them en masse, leading to the two model types winning six years in a row. Jaguar and Mercedes-Benz returned to sports car racing, with Jaguar being the first to break Porsche's dominance with victories in 1988 and 1990 (with the XJR-9 and Jaguar XJR-12 respectively). Mercedes-Benz won in 1989, with what was seen as the latest incarnation of the elegant "Silver Arrows", the Sauber C9, while an influx of Japanese manufacturer interest saw prototypes from Nissan and Toyota. In 1988 too, a W.M. Peugeot set up a new record speeding at 405 km/h (252 mph) in the Ligne Droite des Hunaudières, famous for its 6 km (3.7 mi) long straight. Mazda would be the first Japanese manufacturer to succeed, with their unique rotary-powered 787B winning in 1991. In 1992 and 1993, Peugeot dominated the race with its Peugeot 905 as the Group C formula and World Sportscar Championship were fading in participation. The circuit would also undergo one of its most notable changes in 1990, when the 5 km long Mulsanne was modified to include two chicanes in order to stop speeds of more than 400 km/h (249 mph) from being reached. This began a trend by the ACO to attempt to slow the cars on various portions of the track; although speeds over 320 km/h (199 mph) are still regularly reached at various points on a lap. Following the demise of the World Sportscar Championship, Le Mans saw a resurgence of production-based grand tourer cars. Thanks to a loophole in the rules, Porsche succeeded in convincing the ACO that a Dauer 962 Le Mans supercar was a production car, allowing Porsche to race their Porsche 962 for one final time, dominating the field. Although the ACO attempted to close the loop hole for 1995, newcomer McLaren would win the race in their supercar's first appearance thanks to the reliability of the BMW V12 powered F1 GTR, beating faster yet more trouble-prone prototypes. The trend would continue through the 1990s as more exotic supercars were built in order to skirt the ACO's rules regarding production-based race cars, leading to Porsche, Mercedes-Benz, Toyota, Nissan, Panoz, and Lotus entering the GT categories. This culminated in the 1999 event, in which these GT cars were faced with the Le Mans Prototypes of BMW, Audi, and Ferrari. BMW would survive with the victory, their first and only overall Le Mans win to date, while Mercedes left sportscar racing indefinitely following two catastrophic though non-fatal crashes stemming from severe aerodynamic flaws with their CLR. This strong manufacturer influence led the ACO to lending the Le Mans name to a sports car series in the United States in 1999, known as the American Le Mans Series, which ran until the end of the 2013 season after which it merged with Grand-Am to form the United SportsCar Championship. Many major automobile manufacturers withdrew from sports car racing after 1999 due to the high cost. Only Cadillac and Audi remained, and Audi easily dominated with the R8. Cadillac pulled out three years later, and attempts by Panoz, Chrysler, and MG to beat Audi all fell short. After three victories in a row, Audi provided engine, team staff, and drivers to Bentley, a corporate partner, which had returned in 2001, and in 2003 the factory Bentley Speed 8s beat privateer Audis. The Chevrolet Corvette Racing Team and their C5-R won several times in the GTS class, finishing 1st & 2nd in 2001, 2002, and 2004. They finished 2nd & 3rd in 2003. At the end of 2005, after five overall victories for the R8, and six to its V8 turbo engine, Audi took on a new challenge by introducing a diesel engined prototype known as the R10 TDI. Although not the first diesel to race, it was the first to win at Le Mans. This era saw other alternative fuel sources being used, including bio-ethanol, while Peugeot decided to follow Audi's lead and also pursue a diesel entry in 2007 with their 908 HDi FAP. In the 2008 race between the Audi R10 TDI and the Peugeot 908 HDi FAP, the Audi won by a margin of less than 10 minutes. For the 2009 24 Hours of Le Mans, Peugeot introduced a new energy-recovery system similar to the KERS used in Formula One. Aston Martin entered the LMP1 category, but still raced in GT1 with private teams. Audi returned with the new R15 TDI, but Peugeot prevailed in its first overall win since 1993. The 2010 running reaffirmed the race as a test of endurance and reliability. In adjusting their cars and engines to adhere to the 2010 regulations, Peugeot chose overall speed while Audi chose reliability. At the end of the race, all four Peugeots had retired, three due to engine failure, while Audi finished 1-2-3. The 2011 and 2012 races were marred by a series of accidents. In 2011, in the first hour, the Audi driven by Allan McNish crashed heavily, barrel rolling into a tire wall shortly after the Dunlop Bridge. At night, the defending race-winning Audi driven by Mike Rockenfeller crashed in similar fashion between the Mulsanne and Indianapolis corners. Neither driver was injured, nor were any spectators. The third Audi entry driven by Marcel Fässler, André Lotterer, and Benoît Tréluyer won the race. The 2012 race saw two factory Toyotas replace Peugeot, which had withdrawn earlier, but one of them flipped at Mulsanne Corner. Driver Anthony Davidson suffered two broken vertebrae but was able to exit the car himself. The other Toyota retired with mechanical difficulties shortly after sunset, giving Audi another victory. In 2011, the race became the premier round of the Intercontinental Le Mans Cup, an attempt to make a world championship for endurance racing again. In 2012, the race became the centerpiece of the FIA World Endurance Championship, the successor to the ILMC. The 2012 event was the first time the race was won by a hybrid electric vehicle, which was the Audi R18 e-tron quattro. After Audi's dominance of the event in the early 2000s, Toyota has fielded competitive cars since 2012, Porsche returned to Le Mans in 2014 with a new factory LMP1 program, and Nissan returned to run an LMP1 program in 2015. Audi withdrew from racing at the 24 Hours of Le Mans in 2016 and Nissan only after one attempt in 2015. Porsche won the race in 2015, 2016 and 2017 with its hybrid 919, and remains the most successful manufacturer at Le Mans, with 19 overall victories, including a seven straight from 1981 to 1987. In 2018, Toyota took their first Le Mans win with Fernando Alonso, Sébastien Buemi and Kazuki Nakajima driving. Le Mans has seen many innovations in automotive design to counteract the circuit's difficulties. These have either been dictated by rules or have been attempts by manufacturers to outwit the competition. Some innovations were incorporated into the common automobile. One of the keys to Le Mans is top speed, caused by the long straights that dominate the circuit. This has meant cars have attempted to achieve the maximum speeds possible instead of relying on downforce for the turns. While early competitors' cars were street cars with their bodywork removed to reduce weight, innovators like Bugatti developed cars which saw the beginnings of aerodynamics. Nicknamed tanks due to their similarity to military tanks in World War I, these cars used simple curves to cover all the mechanical elements of the car and increase top speed. Once Le Mans returned after World War II, most manufacturers would adopt closed bodies which were streamlined for better aerodynamics. A notable example in the changes brought about by aerodynamics are the 1950 entries by Briggs Cunningham. Cunningham entered two 1950 Cadillac Coupe de Villes, one nearly stock and the other completely rebodied in a streamlined aluminum shape developed by Grumman Aircraft Engineering Corporation that looked so unusual that it was nicknamed "Le Monstre" by the French press. The smoothing of body shapes and fairing-in of various parts of the machine brought about by the continual search for reduction of aerodynamic drag led to a separation from Grand Prix cars, which rarely had large bodywork. As the years went on, bodywork became all enveloping, while at the same time lighter. The larger bodywork with spoilers were able to provide more downforce for the turns without increasing the drag, allowing cars to maintain high speeds. Extended bodywork would usually concentrate on the rear of the car, usually being termed long tail. The bodywork also began to cover the cockpit for less drag, although open cockpits would come and go over the years as rules varied. Aerodynamics reached its peak in 1989, before the Mulsanne Straight was modified. During the 1988 race, the crew of a Peugeot powered W.M. prototype taped over the engine openings, allowing Roger Dorchy to set a recorded speed of 405 km/h (252 mph) down the Mulsanne in a publicity stunt, although the car was almost undrivable elsewhere on the circuit and the engine was soon destroyed from a lack of cooling. However, for the 1989 event, the Mercedes-Benz C9 reached 400 km/h (249 mph) under qualifying conditions. A wide variety of engines have competed at Le Mans, in attempts to not only achieve greater speed but also to have better fuel economy, and spend less time in the pits. Engine sizes have also varied greatly, with the smallest engines being a mere 569 cc (Simca Cinq) and the largest upwards of 8,000 cc (SRT Viper GTS-R). Supercharging was an early innovation for increasing output, first being raced in 1929, while turbocharging would not appear until 1974. The first car to enter without an engine run by pistons would be in 1963, when Rover partnered with British Racing Motors to run a gas turbine with mixed success, repeating again in 1965. The American Howmet Corporation would attempt to run a turbine again in 1968 with even less success. Although the engines offered great power, they were hot and fuel-inefficient. Another non-piston engine that would appear would be a Wankel engine, otherwise known as the rotary engine. Run entirely by Mazda since its introduction in 1970, the compact engine would also suffer from fuel economy problems like the turbine had, yet would see the success that the turbine lacked. After many years of development, Mazda finally succeeded in being the only winner of the race to not have a piston-powered engine, taking the 1991 event with the 787B. Rotary engines were banned by the ACO following Mazda's win. Alternative fuel sources would also play a part in more normal engine designs, with the first non-gasoline car appearing in 1949. The Delettrez Special would be powered by a diesel engine, while a second diesel would appear in the form of the M.A.P. the following year. Although diesel would appear at other times over the race existence, it would not be until 2006 when a major manufacturer, Audi, would invest in diesels and finally succeed, with the R10 TDI. Ethanol fuel appeared in 1980 in a modified Porsche 911, leading to a class win. Alternative biological fuel sources returned again in 2004 with Team Nasamax's DM139-Judd. In 2008, biofuels (10% ethanol for petrol engines and biodiesel for diesel engines) were allowed. Audi was the first to use next-generation 10% BTL biodiesel developed by Shell and manufactured from biomass. Beginning in 2009, new regulations allowed hybrid vehicles, with either KERS or TERS (Kinetic/Thermal Energy Recovery System) setups. But only electrical (i.e., batteries) energy storage was allowed, ruling out flywheel-based energy recovery. Cars with KERS were allowed to race in 2009 under specific classification rules. Since 2010, they were able to compete for points and the championship. In 2012 the first KERS-equipped car won; the Audi R18 e-tron with a flywheel hybrid system by Williams Hybrid Power activated and drove the front wheels. This was only allowed in certain zones, after the car had accelerated to at least 120 km/h, in order to cancel out the acceleration advantage that four-wheelers could gain out of corners. In the same year, Toyota also started with a hybrid car, the TS030, which used KERS to power its rear wheels, meaning its usage was not restricted. With increased speeds around the track, brakes become a key issue for teams attempting to safely bring their cars down to a slow enough speed to make the Mulsanne Corner turn. Disc brakes were first seen in 1953 when the Jaguar C-Type raced at Le Mans. In 1955 the Mercedes-Benz 300 SLR introduced the air brake using a large opening hood on the rear of the car. In the 1980s, anti-lock braking systems became standard on most Group C cars as a safety measure, making it less likely that cars lose control at high speeds. By the late 1990s, reinforced carbon-carbon brakes were adapted for better stopping power. For a list of winning drivers, teams, and cars, see List of 24 Hours of Le Mans winners. The most successful participant of all time at Le Mans, Danish driver Tom Kristensen, has nine wins (7 with Audi), the latest in 2013. Over the years, many manufacturers have managed to take the overall win, while even more have taken class wins. The most successful marque in the history of the race is Porsche, which has taken nineteen overall victories, including seven in a row from 1981 to 1987. Audi is next with thirteen wins, and Ferrari follows with nine, also including six in a row from 1960 to 1965. Since 2000 Audi has dominated the event, winning 13 times in 15 years of participation. Audi and Team Joest have had two hat-tricks, the first being in 2000, 2001, and 2002. 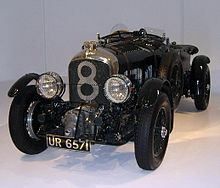 Jaguar has seven wins, while Bentley, Alfa Romeo, and Ford all won four races in a row, with Bentley recording two additional victories in other years. In 2018, Toyota became only the second Japanese marque to win, following Mazda in 1991. Mazda is also the only company to win with a rotary engine. Three drivers stand apart for their number of victories. Initially Jacky Ickx held the record at six, scoring victories between 1969 and 1982, earning him an honorary citizenship to the town of Le Mans. His frequent racing-partner, Derek Bell, trailing by a single win, with five. However, Dane Tom Kristensen has beaten this record with nine wins between 1997 and 2013, including six in a row. Three-time winner Woolf Barnato (1928 to 1930) and American racing legend A. J. Foyt (1967) are the only drivers to have won every Le Mans in which they participated. Henri Pescarolo won the race four times, and holds the record for the most Le Mans appearances at 33. Japan's Yojiro Terada was active as a driver until 2008, and holds the record for the most Le Mans starts without an overall win. Graham Hill is the only driver to win the so-called Triple Crown of Motorsport, winning the Indianapolis 500 (1966), Monaco Grand Prix (1963, 1964, 1965, 1968, 1969), and the 24 Hours of Le Mans (1972). Le Mans has seen a number of fatal accidents, due in part to the very high speed nature of all variants of the track throughout history. The largest one was in 1955, when more than 80 spectators and driver Pierre Levegh were killed. In the wake of the disaster, many races were cancelled, including the Grand Prix races in Germany, Spain, and Switzerland (the latter as a part of a blanket ban on motorsport round-track races that was maintained until 2018). The accident led to safety regulations in all motorsports for both driver and spectator protection. Almost all decades in which Le Mans has been run have seen their fair share of horrific accidents, such as in 1972 when Swede Joakim Bonnier was catapulted into a forest surrounding the circuit after hitting a privately entered Ferrari near the Indianapolis section; Bonnier was killed instantly. The 1980s was a decade where some of the race's worst-ever accidents occurred. Although Armco barriers had been installed along the straight in 1969 there were still no chicanes on the Mulsanne Straight – the place where almost all of the worst accidents took place during that time. The prototypes, most of which were equipped with very powerful turbocharged engines in those days, were capable of doing 240-250+ mph (387–403 km/h) before reaching the kink and would still be doing the same kind of speeds at the end of the 3.6 mile (6 km straight) – and even through the kink, which was a flat-out bend for all the cars on the track. In 1981, Belgian Thierry Boutsen crashed horrifically on the Mulsanne Straight in his WM-Peugeot, killing a marshal, and in the same race Frenchman Jean-Louis Lafosse was killed also on the Mulsanne Straight when his Rondeau suffered suspension failure and steered very suddenly to the right and slammed into the Armco barrier on the driver's side at extreme speeds. The 1984 race saw British privateer John Sheldon crashing at more than 200 mph (320 km/h) at the Mulsanne Kink; his Aston Martin V8 powered Nimrod tore through the Armco barriers into the trees. The resulting explosion was so violent that the woods next to the track caught fire. Although Sheldon survived with severe burns, a track marshal was killed; two others were also severely injured. Sheldon's own teammate, American Drake Olson in the second Nimrod-Aston Martin who was following him down the straight, crashed heavily after running over Sheldon's bodywork; he went into severe shock but survived with minor injuries. The field was under the safety car for over an hour while the crash site was cleared and the destroyed Armco barriers were replaced. In 1985 a similar accident befell Briton Dudley Wood in a Porsche 962 during practice. The impact of the car against the Armco, considering Wood was doing more than 230 mph (371 km/h), was so hard that it cracked the engine block. Wood survived without injury. Also in 1985 John Nielsen flipped his Sauber-Mercedes while going over the Mulsanne hump at more than 220 mph (355 km/h). The car landed on its roof and was destroyed, but Nielsen escaped without injury. In 1986, Jo Gartner drove a Porsche 962C into the Mulsanne barriers and was killed instantly after the car rolled multiple times, vaulted some Armco barriers, and knocked down a telegraph pole. And in 1987, American Price Cobb crashed a works Porsche 962C after slipping on oil during Wednesday practice. The fuel tank exploded and the car burned to the ground but Cobb escaped without injury. Gartner's fatal accident remained the most recent death in the race until Allan Simonsen's crash in 2013. However, there was one fatality during a practice session in 1997 (Sebastien Enjolras). In 1999 the Mercedes-Benz CLRs suffered from aerodynamic instability leading to airborne cars. After initially happening at the Le Mans test day, Mercedes claimed to have solved the problem, only to have it occur again at warmup. Mark Webber was the unlucky driver whose car flipped on both occasions. The final and most damaging accident occurred during the race itself when Peter Dumbreck's CLR became airborne, flying over the safety fencing and landing in the woods several metres away. No drivers were badly hurt in any of the three accidents, but Mercedes-Benz withdrew its remaining entry and ended its entire sportscar programme. In 2011, two horrific accidents occurred to two of the three factory Audis in the LMP1 class. Near the end of the first hour, the No. 3 car driven by Allan McNish collided with one of the Ferrari GT cars, resulting in McNish's car smashing into the tyre wall and being thrown into the air at the Dunlop chicanes, resulting in pieces of bodywork flying over and nearly hitting many photographers on the other side of the barrier. In the eleventh hour of the race, another accident occurred, this time to the No. 1 car driven by Mike Rockenfeller, when he had contact with another Ferrari GT car. In the runup to Indianapolis corner, Rockenfeller's Audi was sent into the outside barrier at over 170 miles per hour (270 km/h). Only the main cockpit safety cell of the car remained along with major damage being done to the barriers that needed to be repaired before the race was resumed. Audi had switched to a closed-cockpit car starting in 2011, a decision credited for the fact that neither driver was injured. The 2014 regulations required all cars to be closed-cockpit as a direct result of the 2011 accident. In 2012, Anthony Davidson, driving for the returning Toyota team in a Toyota TS030 Hybrid, collided with a Ferrari 458 GT2 of Piergiuseppe Perazzini, and became airborne before crashing into the tyre barrier of the Mulsanne Corner at high speed. The Ferrari also ended up in the barrier, flipping and coming to a halt on its roof. Davidson suffered broken vertebrae. In 2013, Dane Allan Simonsen died after crashing into the barriers at Tertre Rouge. When the car collided with the guard rail, a mature tree had been touching the barrier, thereby preventing the guard rail from performing its safety function. The 1964 event plays a critical part in the Academy Award–winning Un Homme et Une Femme, in which the wife of the driver hero commits suicide when she mistakenly thinks that he is killed in an accident. The 1969 event, known for its close finish, was portrayed in a short film called La Ronde Infernale. This was given a limited cinema release, but is now available on DVD. The race became the center of a major motion picture in 1971 when Steve McQueen released his simply titled Le Mans, starring McQueen as Michael Delaney, a driver in the 1970 event for the Gulf Porsche team. Likened to other motorsports films such as Grand Prix for Formula One racing and Winning for the Indianapolis 500, Le Mans is the best known film to center on sports car racing. It was filmed during the race using modified racing cars carrying cameras, as well as purchased Porsche 917s, Ferrari 512s and Lola T70s for action shots made after the race. The Porsche 908 which served as a camera car in the race actually finished, yet was so far behind the winners due to lengthy reel changes during pit stops that it was not classified in the results. Michel Valliant was a 2003 French movie about a French comic book motorsports hero that featured events from the 2002 race although it was not explicitly about Le Mans. Again using two camera cars to tape action during the race, the French film was not as widely accepted as Le Mans had been. The 1974 TV show The Goodies featured an episode entitled "The Race" involving a comedic trio attempting to run Le Mans. A documentary film called Truth in 24 narrated by Jason Statham was about the Audi team's effort to win a fifth straight title in 2008 in which Le Mans was prominently featured. A sequel film about the Audi team's victory in the 2011 race, Truth in 24 II, was released four years later in 2012, also narrated by Statham. A documentary film called The 24 Hour War directed by Adam Carolla and Nate Adams, starring AJ Baime, Henry Ford III, David Hobbs and Mario Andretti, is about the Ford versus Ferrari rivalry at Le Mans, one of the most famous battles in racing history. The race has also been used for several video games over the years, some of which have allowed players to compete for the full 24 hours. Motors TV covered the Le Mans 24 Hours in its entirety in 2006 and 2007, including coverage of the scrutineering, qualifying, driver parade, warmup, and race. In the United States, FOX owned SPEED Channel, followed by Fox Sports 1 and Fox Sports 2 aired complete race coverage live either on-air or online through a combination of coverage from the French host broadcaster and its own pit reporting crew for a number of years. That deal ended after the 2017 season. A United States television deal was not done for the 2018-19 WEC Super Season because of a renegotiation of its European contract. In 2008, Eurosport secured a multi-year deal to show the entire race, including the qualifying and the motorcycle race. Every hour of the 2008 race was broadcast in segments on the main channel and on Eurosport 2, but in recent years, a couple of hours were missed due to scheduling clashes with other sporting events. In addition, Eurosport provided live streaming on its website to subscribers. Since 2009, however, Eurosport and Eurosport 2 have covered all the action, and beginning in 2018, Eurosport gained United States broadcast rights for the World Endurance Championship for the race only on Motor Trend, a channel also owned by Eurosport's parent company. Qualifying and practices aired on a direct-to-consumer streaming platform from Motor Trend magazine. In Australia in 2012, Ten Sport showed the race live and in full online. The FIA WEC shows the race live via a subscription service for the whole 24 hrs on their website. The race is also broadcast (in English) on radio by Radio Le Mans. Broadcast from the circuit for the full 24 hours, it allows fans to listen to radio commentary. Radio Le Mans is also broadcast through internet radio online and via satellite radio on Sirius XM Radio. Since 2001, the ACO has allowed the "Le Mans Legend" event to participate on the full Circuit de la Sarthe. These exhibition races involve classic cars that had previously run at Le Mans or are similar to ones that had. Each year, a particular era of cars may participate, with the featured era changing from year to year. Though most drivers in this event are amateurs, some noted professional drivers have appeared to race cars they had previously run, such as Stirling Moss and Derek Bell. Starting in 2002, the "Le Mans Classic" has been held as a biennial event on the full 13 km (8.1 mi) circuit in July. The races take place over a full 24-hour day/night cycle, with starts on set times allowing cars from the same era to compete at the same time. A team typically consists of a car in each class, and the team with the most points accumulated over five or six classes is declared the overall winner. The classes are based on the era in which the cars would have competed. The exact class requirements are re-evaluated for every event, since for each event, the age for the youngest entries is shifted by two years. In the first event, five classes ran more short races; later events have featured six classes running fewer but longer races. Drivers are required to have an FIA International Competition license. This event also includes a large Concours d'Elegance and auction. ^ "Weekly auto agenda: Le Mans". The Independent. 11 June 2010. Retrieved 22 April 2011. ^ "Risi Competizione is a Houston-based, professional Ferrari racing team founded and managed by Giuseppe Risi located in Houston, Texas". Risi Competizione. Archived from the original on 22 December 2017. Retrieved 19 December 2017. ^ "FIA WEC 86th 24 Heures du Mans Race – Provisional Classification" (PDF). Automobile Club de l'Ouest. 17 June 2018. Retrieved 8 July 2018. ^ "Past seasons". fiawec.com. Retrieved 4 April 2019. ^ "Calendar". fiawec.com. Retrieved 4 April 2019. ^ "Schedule". lemans.org. Archived from the original on 7 August 2011. Retrieved 22 April 2011. ^ "Le Mans 24 Hour – Michelin set new records at Le Mans". Yahoo Sport/Eurosport. 23 June 2010. Retrieved 22 April 2011. ^ "Two major car families". lemans.org. Archived from the original on 7 August 2011. Retrieved 22 April 2011. ^ "LE MANS: Inside The 2014 LMP1 Regulations". Auto-racing.speedtv.com. 27 November 2012. Archived from the original on 10 July 2013. Retrieved 5 August 2013. ^ "ACO - Automobile Club de l'Ouest". www.24h-lemans.com. Retrieved 8 June 2018. ^ "Iron Man Rotation for Macneil and Bleekemolen". www.racer.com. Archived from the original on 17 June 2015. Retrieved 8 June 2015. ^ Young, Eoin (November 2013). "Dan Gurney's 1967 Champagne Week" (PDF). Victory Lane: 42–44. Retrieved 21 June 2014. ^ "Spraying the Champagne". Dan Gurney's All-American Racing. Retrieved 21 June 2014. ^ a b "Regulation | FIA World Endurance Championship". www.fiawec.com. Archived from the original on 2 July 2016. Retrieved 2 July 2016. ^ a b c d "24 key dates for the 24 Hours". ACO. Archived from the original on 22 April 2012. Retrieved 20 April 2012. ^ "THE RECORDS TO BE BEATEN". 24h-lemans.com. Retrieved 11 June 2014. ^ "908 HY to close Le Mans Series in hybrid style". AutoBlog. ^ "Mulsanne's Corner: Maximum Speeds at Le Mans, 1961-1989". www.mulsannescorner.com. Retrieved 8 June 2018. ^ "Mulsannescorner.com, "2004 Nasamax DM139"". Archived from the original on 15 September 2008. Retrieved 6 August 2008. ^ "Audi R10 TDI on next generation Biofuel at Le Mans". Audi Motorsport. 30 May 2008. Archived from the original on 19 November 2008. Retrieved 6 August 2008. ^ "Le Mans 2009 – 2001 regulations released". Racecar engineering. 19 November 2008. Archived from the original on 28 December 2008. Retrieved 11 October 2010. ^ "Audi wins 13th title at Le Mans". ESPN. Associated Press. Retrieved 16 June 2014. ^ Baldwin, Alan. "Audi win Le Mans for 13th time". Reuters. Reuters UK. Retrieved 16 June 2014. ^ "Audi Wins Le Mans For 13th Time Ahead Of Toyota And Porsche". Huffington Post. Huffington Post UK. Retrieved 16 June 2014. ^ Dan Knutson (3 June 2003). "Points Race Stays Tight; Montoya Joins Elite Company With Victory". Archived from the original on 6 November 2007. Retrieved 3 December 2007. ^ Henri Boulanger. "Monaco Grand Prix Glitz Draws Rising Stars". IntakeInfo.com. Archived from the original on 11 December 2007. Retrieved 5 December 2007. ^ "Mark Cole's Le Mans 2013". Dailysportscar.com. 2013-07-15. Retrieved 2013-08-05. ^ "Davidson sustains broken back following airborne crash at Le Mans". Autosport. Haymarket Press. 16 June 2012. Retrieved 16 June 2012. ^ "Anthony Davidson breaks back after Le Mans 24 Hour accident". BBC Sport. BBC. 17 June 2012. Retrieved 18 June 2012. ^ "Driver killed during Le Mans 24-Hours". En.espnf1.com. 2013-06-22. Retrieved 2013-08-05. ^ "Race Car Driver Deaths: The Medical Causes of Racing Deaths w Examples". parathyroid.com. 23 June 2013. Retrieved 8 June 2018. ^ "The 24 Hour War (2016)". IMDb.com. Retrieved 12 June 2017. ^ "Eurosport". Archived from the original on 13 October 2010. Retrieved 11 October 2010. ^ "TEN to stream Le Mans online". TV Tonight. Retrieved 15 June 2011. ^ "FIA WEC". Retrieved 12 June 2017. Wikimedia Commons has media related to 24 Heures du Mans.